FORT WORTH — After spending two weeks in Panama preparing to celebrate World Youth Day 2019, Jasmine Rivas returned to Texas with a deeper understanding of the universal Church. 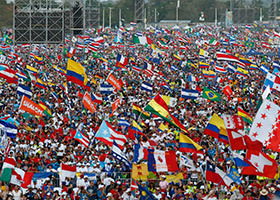 Despite long walks in soaring temperatures, crowded streets, and spotty access to electricity and internet access, Rivas described celebrating Mass with Pope Francis and 1 million people amazing and unforgettable. 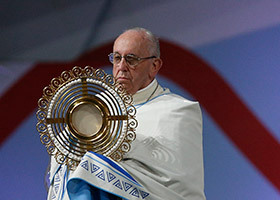 Referencing the Scripture verse chosen for WYD 2019, “I am the servant of the Lord. Let it be done to me according to your word,” (Lk 1:38) the pope asked his listeners to follow Mary’s fiat. The pope’s words touched her heart, Rivas said. The Saginaw student was part of a 17-member contingent from St. Thomas Parish who attended the global event from Jan.22-27 in and around Panama City. 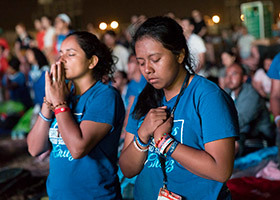 It was the only delegation from the Diocese of Fort Worth to participate in WYD 2019 largely because of timing, according to Mirna Cano, St. Thomas youth director. The youth group raised $50,000 by selling baked goods and tamales and hosting a garage sale and brisket dinners. A portion of the expense was paid personally. 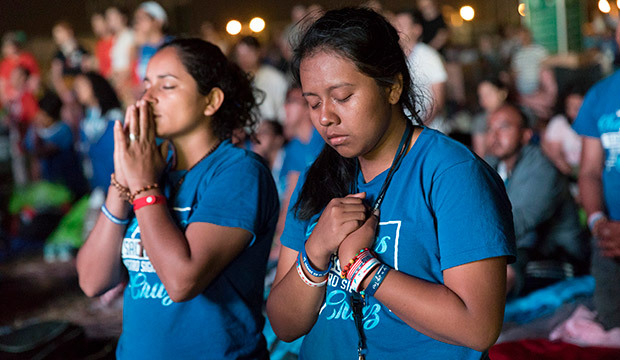 Before traveling to Panama City where they listened to talks, attended worship services, and celebrated Mass with Pope Francis, nine teens, their chaperones, and pastor Father Mathew Kavipurayidam, TOR, spent a week in El Valle de Anton — a small town three hours away from the capital city. Living in the mountain village for “Days in the Diocese” helped the young Texans learn about the culture and family life in Panama. Villagers prepared meals for their American guests and escorted them to church every day. “Our backyard was filled with majestic mountains and we hiked and saw beautiful waterfalls,” said 13-year-old Joshua Gomez. But the eighth grader’s lasting memory of El Valle is the festive way local Catholics celebrate Mass. Bustling Panama City was very different. The capital city’s population boomed as visitors arrived for the Jan. 27 papal Mass. Fr. Mathew accompanied pilgrims from his parish on the journey and was chosen to concelebrate Mass with Pope Francis along with 400 other priests. Members of the St. Thomas youth group came home from the trip enthusiastic and eager to share their faith. On their first weekend home, the young pilgrims stood in the church vestibule collecting money for the St. Vincent de Paul Society. “They were inspired by the pope’s message but as an adult, I was too,” the youth director admitted. 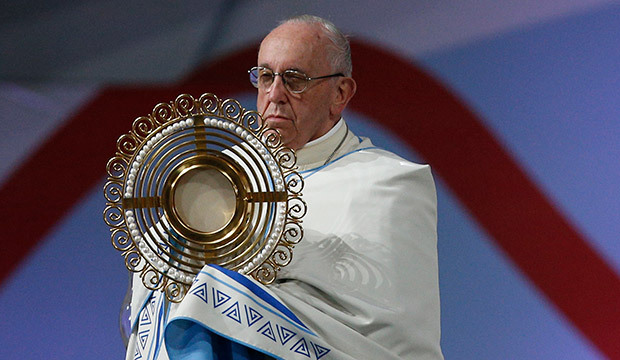 In his homily, Pope Francis reminded older Catholics to see youth through God’s eyes. They need roots and a sense of belonging, he added. “It’s our responsibility to provide that, so I came back with a renewed sense of commitment to my faith, my church, my community, and definitely to the youth,” Cano said.